PX Euro Diesel IV-UHPD 10W-40 is a an Ultra High Performance Diesel (UHPD) low ash diesel engine oil blended with only highest quality synthetic base stocks and high technology core additive package. 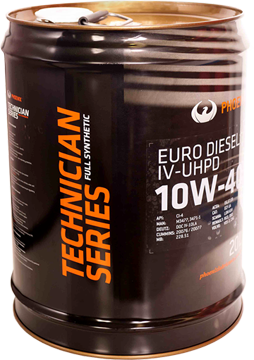 PX Euro Diesel IV-UHPD 10W-40 meets the Euro IV, V, and VI emission requirements and is suitable for use with NOx reduction systems and particulate filters and designed for use in combination with low sulphur diesel fuel. It can dramatically reduce carbon deposits created by high temperatures and arduous condition; therefore greatly reducing oil consumption.